6033/83 - Matt black frame and polarised lenses. 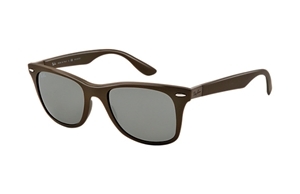 The Ray-Ban RB 4195 is also known as the 'Wayfarer Liteforce' and is one of this season's new light weight sunglasses that are so comfortable to wear. The Ray-Ban RB 4195 sunglasses come with their own branded case, cloth and packaging, and are covered by the 12 month no quibble sendoptics guarantee. 601/71 - Black frame and G15 lenses.